Love this rich and creamy homemade tomato sauce that gets toss with linguini noodles! Of course, you can use other long noodles like angel hair or spaghetti! You can freeze everything together but the heavy cream...you’ll want to swirl that in after the tomato sauce is reheated and bubbling. Enjoy! Open the crushed tomatoes and petite diced tomatoes. In a large skillet or saucepan, saute the chopped onion and minced garlic in the olive oil for 1 minute. Stir in the crushed tomatoes and undrained petite diced tomatoes. 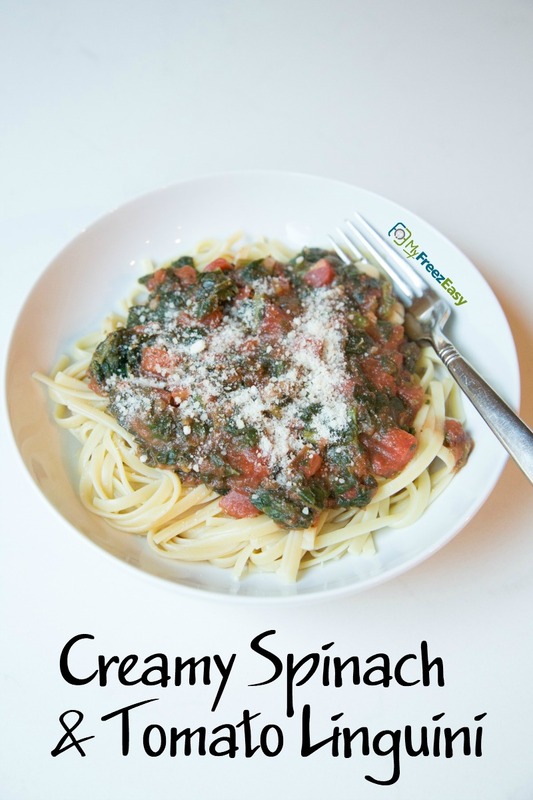 Bring to bubbling, then stir in the spinach, Italian seasoning and swirl in the heavy cream. Season with salt and pepper to taste. Reduce heat and let simmer for 10 minutes, to allow flavors to mingle. Cook pasta, as directed. Drain and toss cooked pasta with the tomato sauce. 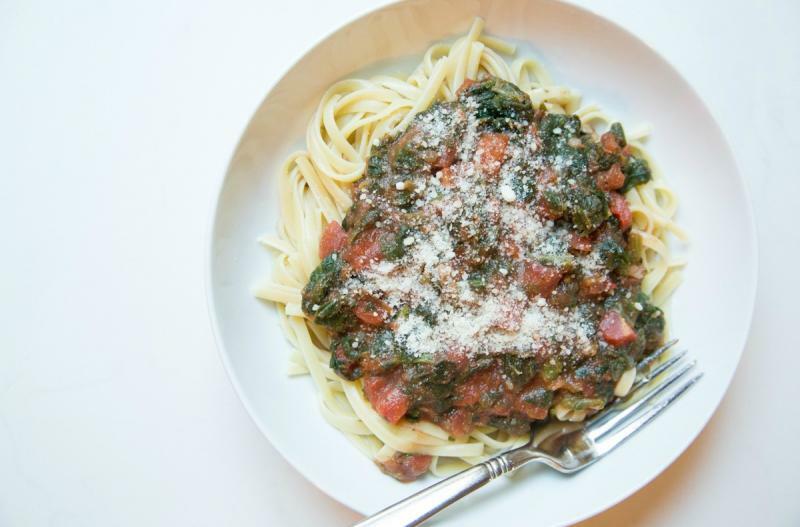 Serve Creamy Spinach and Tomato Linguini with shredded Parmesan cheese garnish and side of veggies. Open 2 cans of crushed tomatoes and 2 cans of petite diced tomatoes. Put baggie in the freezer and freeze up to 6 months in fridge freezer or 12 months in a deep freezer. Thaw in the fridge overnight, or a warm bowl of water for about 20 minutes. Transfer to skillet and reheat the sauce, then stir in the heavy cream. Cook the pasta as directed and toss together with the sauce. Omit the cream and Parmesan cheese garnish for dairy-free meal. Use gluten-free pasta for a gluten-free meal. Thaw completely and reheat the sauce in skillet, then stir in the heavy cream. Cook the pasta as directed and toss together with the sauce. Serve with veggies and Parmesan cheese garnish.